Herb vinegars are an excellent gift giving idea. Not only do they look attractive and brighten up any shelf they are on, they also taste delicious and enhance the flavor of any dish they are added to. While herb vinegars in fancy bottles are easily available in several stores, making them for gifting, adds a personal touch that can rival any store-bought gift. What's more making herbs vinegars is uncomplicated and the ingredients are all easily available. Collect decorative bottles in different shapes and sizes. You can find some rather usually-shaped bottles at flea markets and village stalls. Used wine bottles make fabulous herb vinegar containers. Fill your bottles with different combinations of herbs and vinegars and watch the kitchen come alive with color and flavor. Using good quality vinegar will make your efforts look better and taste better. So use the best quality you can afford. White Wine vinegars, Red Wine Vinegars and Rice Vinegars have a smooth taste are good choices as a base. Though White Wine Vinegar has a sharper taste, it does go well with some herbs and is a good choice. Apple Cider Vinegar has an overpowering taste and should be used prudently so that it does not overshadow the flavor of the herbs. All fresh herbs should be gently washed and dried using a paper towel. A few herbs may require some extra preparation. 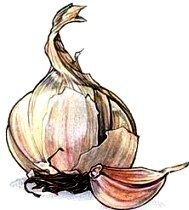 Garlic: Peel, rinse and dry garlic before using. Garlic cloves look charming when strung onto a bamboo skewer in different arrangements. Peppers: After removing the top and seeds of peppers, wash, pat dry and cut into strips of preferred thickness. Green Onions: Wash and pat dry green onions. Cut stems to bottle length prior to inserting into the bottle. Whether you leave the root or cut is off is a matter of personal preference, both look good. Spices: Always use whole spices. Using powdered or ground spices will turn the vinegar cloudy. Some good spices to use include allspice, all types of peppercorns, juniper berries, cumin seed, cloves, coriander seed and bay leaves. Put your selected spices into the prepared bottles. Next put in the garlic skewer if you are using it and then add whatever combination of fresh herbs you choose to. Parsley is great for keeping down floating spices and should be added last. Now add the vinegar up to 12.5mm (½") of the top, put the stopper and let the bottle stand at least 24 hours. You may need to refill the bottle as some herbs and spices tend to soak up the vinegar. All you need to do now is tie a raffia bow around your bottle of herb vinegar, attach a rustic home-made gift tag and you are ready to gift it to any gourmet or non-gourmet chef. A word of caution... avoid using any metal utensils or equipment when making herb vinegars, either during cooking or storing, as metal reacts with vinegar.